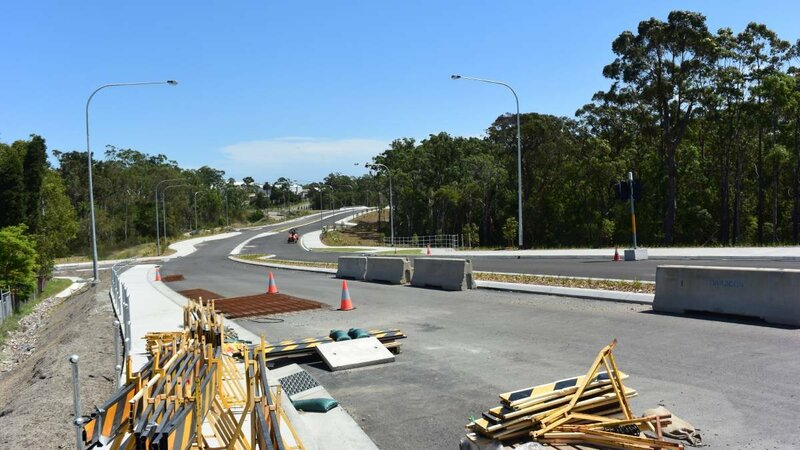 Long-held plans for the Lake Macquarie Transport Interchange and associated roads at Glendale have cleared another hurdle with a main road link set to open in months. But according to Lake Macquarie MP Greg Piper there's a long way to go before this project gets all the funding it needs from the State and Federal governments. Here's how the Newcastle Herald reported the issue on its front page today. THE first part of the long-awaited Lake Macquarie Transport Interchange project is due to open in May. The $25-million section of divided roadway linking Main Road, Cardiff, with the Glendale retail precinct and the Hunter Sports Centre is fast taking shape under the practiced hand of head contractor Daracon. Lake Macquarie Mayor Kay Fraser said this section of road represented stage one, section one, of a project that “has been on the top of the Hunter infrastructure wish list for a long, long time”. Cr Fraser said stage one, section two of the project was a three-span bridge over the main Sydney to Newcastle railway line at Pennant Street, the “essential missing link” connecting Glendale with the Cardiff industrial estate. Cr Fraser said the council had $6 million for the Pennant Street section and was proposing Canberra and Macquarie Street each put in $13 million, meeting a total cost of $32 million. A new economic assessment done for Lake Macquarie City Council outlines a range of economic and social benefits from the full project, which would include a new railway station and bus interchange at Glendale costing $120 million. The Independent Member for Lake Macquarie, Greg Piper, said funding for the Pennant Street bridge was “well overdue” and would again top his budget submission to the state. “I’d add to that the need to extend Munibung Road,” Mr Piper said, referring to a section of road proposed to cross the former Pasminco smelter site. Despite its obvious usefulness, the extension of Munibung Road from the Cardiff industrial estate south-west to the roundabout on Lake Road, Boolaroo, near the new Bunnings Warehouse, has so far failed to attract funding. Lake council had originally hoped that Pasminco’s administrator, Ferrier Hodgson, would pay for the road. But in 2011, Ferrier Hodgson said it was already spending $10 million on infrastructure and “the additional stretch of road connecting Munibung Road to the Cardiff West industrial estate is financially unviable and outside the administrator’s responsibility”. The council has also tried without success to secure funding for the $5.4 million Munibung Road extension through the state government’s Resources for Regions program. Nine out of the 10 projects funded in the latest round of grants were in National Party electorates, leading Mr Piper to call in January for the NSW Audit Office to examine whether “politics” had influenced the decisions. “These projects have the potential to unlock a huge amount of land and job-generating industry,” Mr Piper said on Monday. Cr Fraser said she had spoken to the Berejiklian government’s new Parliamentary Secretary for the Hunter, Catherine Cusack, who had shown interest in the project. “This first section will take a lot of traffic out of the Crossroads and from the roundabout in front of Stockland Glendale, but it’s only the start,” Cr Fraser said. She said Stockland had approval to double the size of the Glendale centre and other development – residential and commercial – would follow, especially once the Pennant Street bridge over the rail line was built. Property Council Hunter director Andrew Fletcher said his organisation was lobbying for the interchange. Its May 12 lunch would examine the project in detail.